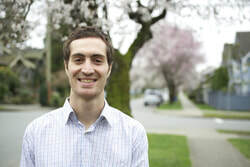 Zia Mehrabi is a Research Associate at the University of British Columbia, where he works on the food system, climate change, and agricultural technology. He is appointed at The School of Public Policy and Global Affairs, the Institute for Resources Environment and Sustainability, and the Center for Sustainable Food Systems. At UBC he helps teach and mentor students, develop ideas, data sets, software, data science, and data analysis on sustainable food systems. He received a BA in Biology, and a DPhil in Food Security from the University of Oxford. He is a contributing author to The Intergovernmental Science-Policy Platform on Biodiversity and Ecosystem Services, a member of the Global Land Programme, and is the working group lead on developing baselines for data driven agronomy for the CGIAR’s Platform for Big Data in Agriculture. He is engaged in public outreach and communication for a better understanding of science, and recently launched the data-driven open art exhibit “The Colours of Food Security” with the Land Use and Global Environment Laboratory at The University of British Columbia. Ramankutty, N., Mehrabi, Z., Waha, K., Jarvis, L., Kremen, C., Herrero, M. and Rieseberg, L.H., 2018. Trends in global agricultural land use: implications for environmental health and food security. Annual review of plant biology, 69, pp.789-815. Mehrabi, Z., Ellis, E.C. and Ramankutty, N., 2018. The challenge of feeding the world while conserving half the planet. Nature Sustainability, 1(8), p.409. Ricciardi, V., Ramankutty, N., Mehrabi, Z., Jarvis, L. and Chookolingo, B., 2018. How much of the world's food do smallholders produce?. Global food security, 17, pp.64-72. Mehrabi, Z. and Lashermes, P., 2017. Protecting the origins of coffee to safeguard its future. Nature plants, 3(1). Mehrabi, Z. and Tuck, S.L., 2015. Relatedness is a poor predictor of negative plant–soil feedbacks. New Phytologist, 205(3), pp.1071-1075.